There are many unanswered questions when it comes to hiring a nanny – a decision that affects your child’s life: Where can I find a nanny? 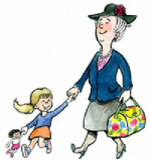 How can I train a nanny? How can I make sure a nanny treats my child well? Stop! Carve out the time to think about what you need from your nanny to ensure the most precious person in your life is safe and sound. Invest 30 minutes to an hour to list requirements, duties, hours of service, days of service and a realistic salary range. Parents who do not take this first step often end up in trouble. Only then can you begin the search. Search for reputable resources to source your nanny. Ask friends and family who they have used and can refer. Research and do your due diligence. Learn the differentiating factors in using an agency versus conducting the search yourself. - Legal working status. Do not hire a non-legal worker for reasons such as less money and/or longer working hours. - Qualified help who has the appropriate credentials in child care. - Employment history –be sure to speak to former employers. - Conduct a full background check, including public records, criminal and credit history. - Conduct a thorough interview process. After you’ve made your decision, trial the candidate for a period of time to ensure he/she is the right fit. Cassford recommends placing a monitoring camera in several locations and letting the nanny know they exist. Make sure you have careful supervision from a specialist to assist with assessing the nanny’s skills, capability to perform the duties adequately and, most importantly, that he/she is a good fit for your household. Top Tips for Teaching Safe Driving Skills and Vehicle Maintenance to Teens!